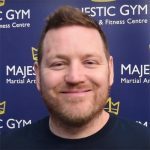 This class is aimed at those students who wish to learn the full range of Thai boxing techniques in addition to a challenging fitness workout. This class can be as demanding as you wish to make it. As your fitness levels increase you will be continually challenged in order to keep you progressing. The Instructor(s) in the session are there to help with technique, motivate and correct faults. Benefits of this session includes quick fat loss, total body muscle toning, superb cardio-vascular endurance, flexibility, stress reduction and improved balance and coordination.